Flying kites is a relaxing summer activity. To make it a little more fun, you can make your own kite. 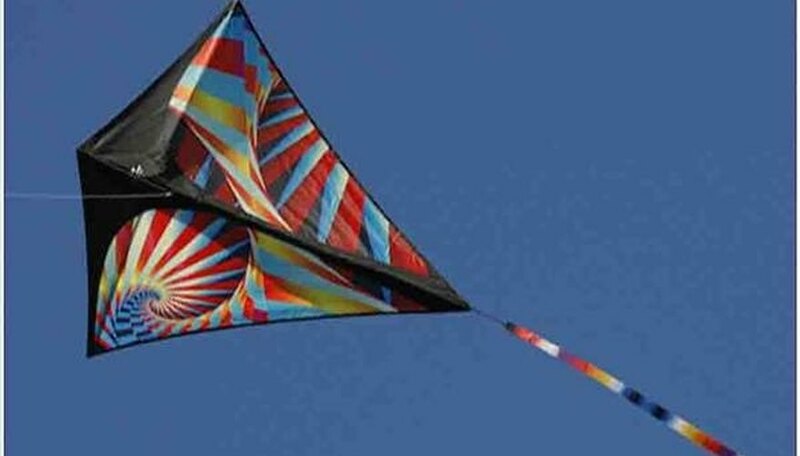 The supplies needed to make a kite are generally cheaper than buying one, and the satisfaction of seeing your own creation flying in sky brings the experience to a new level. Make one dowel 24 inches long and the other 16 inches. Draw a line at the 16-inch point on the long dowel and at the 8-inch point on the short one. Lay the dowels in a cross shape so they meet at the lines you marked. Tie the dowels together with string. It is best to use a crisscross pattern to ensure the most secure hold. Tie a tight knot and cut off any excess string. Cut 1/8-inch-deep notches at each end of the dowels with a box cutter. The notches must be wide enough for the string to slide into. Wrap the string around the top dowel two times, just below the notch. Put the string in the top notch and string it through the remaining three notches to make a diamond. Be sure to wrap the string around each notch two times for extra security. Pull the string so it is tight and tie it in a knot at the top notch. It should now have the general shape of a kite. Cut a 2-foot-long piece of string and tie it to one end of the short dowel. Tie a small loop in the other end of the string and attach it to the opposite side of the short dowel. The string should cause the dowel to bow slightly. Lay a large piece of tissue paper over the kite. Carefully cut the paper into the shape of the kite, but make sure the paper is at least a half-inch larger than the kite on all sides. Cut 1 1/2 inches off all corners of the paper. Lay the paper down on a flat surface. Carefully, but quickly, apply glue along the border of the paper. Lay the front of the kite on the paper. Fold the edges of the paper up over the string and press it down onto the other side of the paper. The string should now be encased in two layers of the paper. Cut a 4-foot-long piece of string. Tie one end of the string to the top of the long dowel, run it under the kite and tie the other end of the string to the bottom of the dowel. This is called the keel and is what the long kite string will be attached to. Cut a 3-foot-long piece of fabric. If you have an old T-shirt, cut a strip out of it. Make it 2 to 3 inches wide. Tie it to the underside of the kite near the bottom of the long dowel. Tie the end of the kite string to the keel in a spot that is close to where the dowels cross. Unravel the kite string and wind it back up to ensure ease of releasing more line when flying the kite.